The first coins have been tossed, whistles have been blown, and a kickoff’s commenced. Football season is upon us! This football season, be ready to wow at any tailgate with these delicious and creative ways to include more of fall’s favorite fruit—apples. 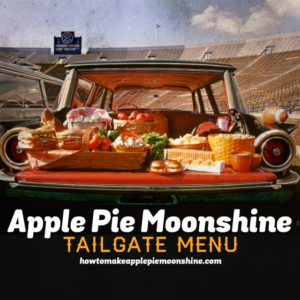 With this Apple Pie Moonshine-inspired tailgate menu, you’ll be the life of the parking lot. Starting with a variety of flavors and dishes for those 21 and over, you’ll be ready to cheer on your favorite teams after you’ve tasted these tasty treats. Apple Pie Moonshine Brats – Hand-wrapped pork sausages stuffed with flavor and a dash of sweet. Apple Cider-slaw – A fresh,crisp, and green apple tart take on a party favorite. Moonshine Meatballs – Sweet and tangy bite sized meatballs. Apple Moonshine Baked Beans – A traditional tailgate dish, packed with tasty hints of apple and bacon . Apple Pie Moonshine Krispies – Oooey Gooey squares with a punch. Place all ingredients into a large bowl. Mix together. Use a sausage piper ( an extension you can get for a meat grinder) to place meat into packaging. Once all meat is sealed in sausage casing and twisted into sections, cut and boil in 3 cups water until mixture is greyish brown. Remove from water and toss on the grill at medium-high heat until golden brown. Make 4-inch-round logs of sausage. Individually tightly wrap each log into food-grade plastic wrap and twist ends closed like you would a piece of candy. Place a large sauce pan with about 2 inches of water on stove and bring to a boil. Carefully lay each wrapped sausage in boiling water for 10 minutes. You can do up to 5 at a time. Rotate, if necessary, to evenly cook. Using tongs, remove sausages from pan. Unwrap carefully. They should be in tight sausage form. Grill on medium-high heat until golden brown. Add all ingredients and toss lightly. Peel and finely dice apple into small pieces. Add garlic, raisins (if desired), onions, and seasoning into a medium-sized mixing bowl with ground turkey. Start heating olive oil in a large nonstick pan on medium heat. Roll meat into balls no bigger than a golf ball and set on a separate plate. Once all are all browned, add to a crockpot. Add about a bottle of BBQ sauce, then add of moonshine. Mix carefully. low for 2 hours. Add beans, chopped apples, moonshine or vinegar, bacon, onions, brown sugar, mustard, chili powder, and BBQ sauce to crockpot. Let sit on medium heat for 4 hours; stir and taste to add more seasoning. Beans should be a thicker consistency. Place pot on low heat. Add butter, marshmallows, and cinnamon. Once marshmallows are completely melted, add moonshine and stir. Add Rice Krispies and stir until completely combined. Place contents in 8×8 pan. Flatten and spread evenly with wax paper. Sprinkle with cinnamon and powdered sugar. Once cool, cut into squares and serve. These recipes will certainly be a touchdown at any fall football party. 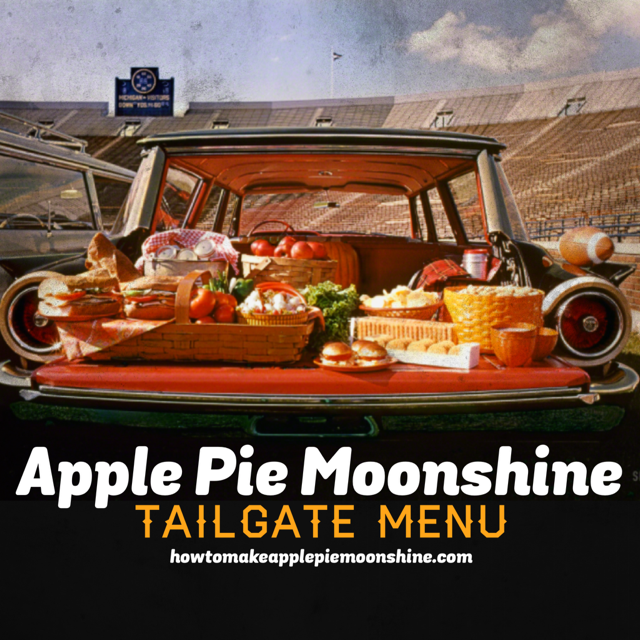 Make sure to check out our Apple Pie Moonshine Tailgate Drink Menu here.